charge of the movie night barbecue. 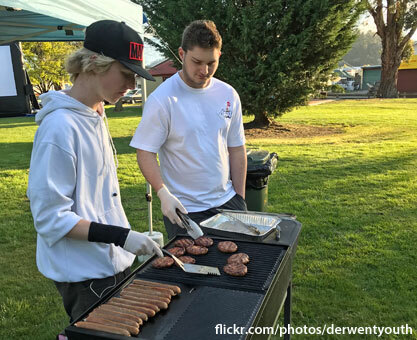 ORGANISERS say Saturday night's school holiday movie night at Arthur Square attracted the biggest attendance since the Derwent Valley Youth Future Action Team (D'FAT) started running outdoor movie nights several years ago. 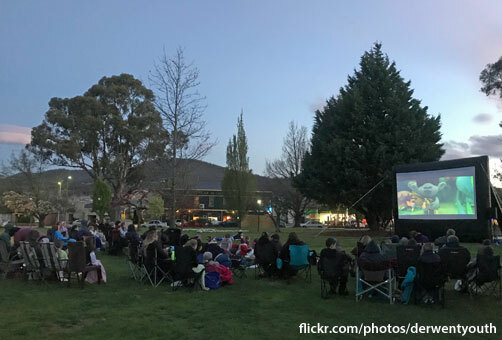 Saturday night's free screening of the 2016 animated movie Trolls was organised in partnership with Tassie Open Air Cinemas, with an audience of about 110 people. Former Derwent Valley Council youth and community participation officer Matt Hill assisted with the arrangements. A spokesman said the turnout was an increase of more than 60 people since the last movie night in July. 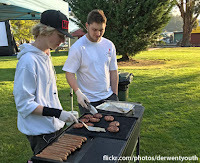 D'FAT members ran a successful barbeuce, selling out of all food during the evening. The scene at the outdoor movie night at Arthur Square on Saturday night.